The Garmin FR 15 has been declared. It will be Garmin’s cheapest GPS-enabled watch so far, keeps track of your activity, pace, distance, your personal fitness records and heart rate and is positioned to give the increasing activity band market a run for its money. The Garmin forerunner 15 has GPS functionality and does all that an activity band can do like keeping track of calories, counting steps (like the VivoFit we reviewed back in March) plus a lot of added features. It offers a total lifestyle and fitness solution and is near the activity band bracket. It is priced at $199 and $249 including the bundle. You also get an alert from the forerunner 15 when you you’ve been sitting for too long and haven’t had an activity for about 1 hour. This reminder or alert will only be reset if you take a few minutes to walk around. In today’s world of high tech gadgetry, Garmin Forerunner 15 stands alone as a must have runner’s smart watch. 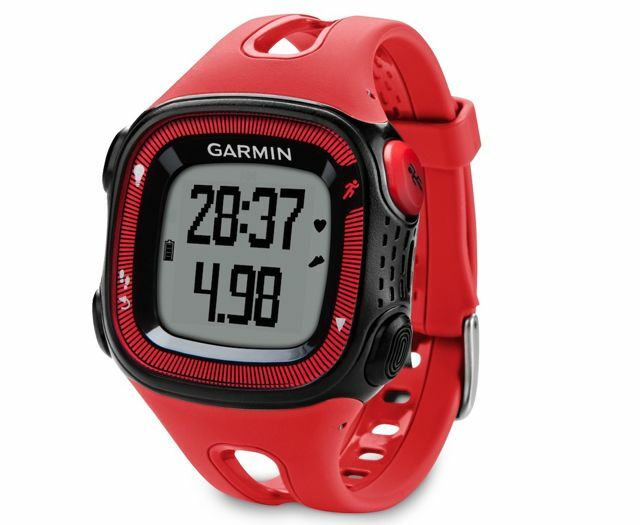 Weighing in at 36 grams for the small version or 43 grams for the larger one, this waterproof watch is an easy to use, stylish and lightweight way for the runner to keep time and so much more. It features a comfortable, adjustable stream lined wrist band and a large, easy to read display monitor. The FR15 which is Garmin’s most recent product has just been announced by them. It’s the budget GPS range’s most recent edition that was introduced some 24 months back with the FR10. By integrating many of the everyday activity monitoring features of the Vivofit activity tracker released earlier this year, the Garmin FR15 builds on previous editions. Garmin Forerunner 15 keeps track of distance, calories burned, and pace. 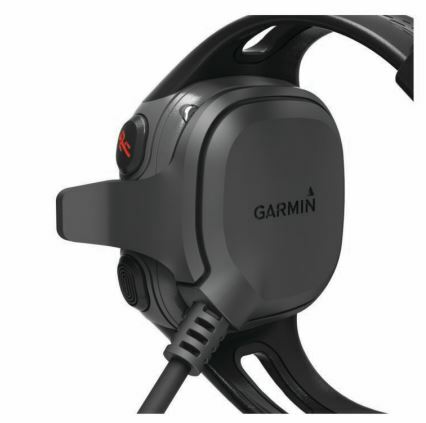 It features a USB port that allows tracking of information and the sharing of data to an online community, Garmin Connect. The only drawback to the Forerunner 15’s USB mass storage is that the computer must be at least Windows XP or MAC OS X 10.4. This watch has a long battery life using a rechargeable lithium-ion battery. On average the battery will last 8 hours in training mode and GPS mode or up to five weeks using it in watch mode. 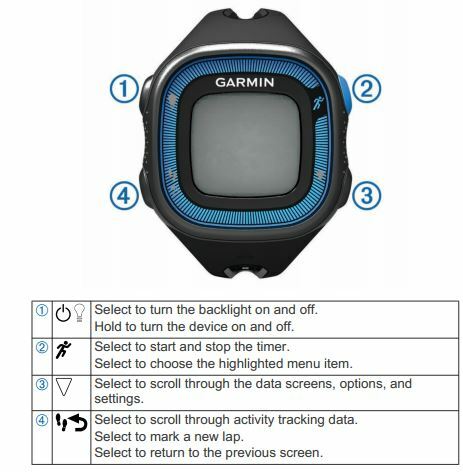 The GPS enabled Garmin Forerunner 15 features a high sensitivity receiver, but while it will map a run it does not allow the runner to load maps. It has a customizable screen and it is very user friendly, adjusting between modes with the touch of a button. Adjusting the display to exercise mode enables the watch to display miles run, time and pace effortlessly. The “auto lap” feature alerts the runner after every mile run and displays the time and pace of the completed mile and notifies the runner of any personal bests or records broken. In activity tracking mode, the Garmin Forerunner 15 keeps track of distance used in daily activities and even reminds the user to “move” during extended periods of inactivity. You can upload your activities when connected to a PC or Mac to Garmin’s free online fitness community, Garmin Connect, so you are able to measure your progress, set and track goals, and also challenge your friends. Relive a run, check in on progress to a daily step goal, evaluate heart rate, earn virtual badges and join online challenges for extra motivation to continue moving throughout the day. The device can store personal records together with data fields personalized to match the kind of exercise you are doing with its four button user input. You also have the ability to track all your activities when you’re out of sight of GPS satellites, in the gym or on the treadmill with the included optional foot pod. The forerunner incorporates calories burned all day, daily activity tracking and counting steps to ensure you are active between workouts. It is ideal for outdoor and indoor training with treadmill runs precisely tracked by the optional foot pod. 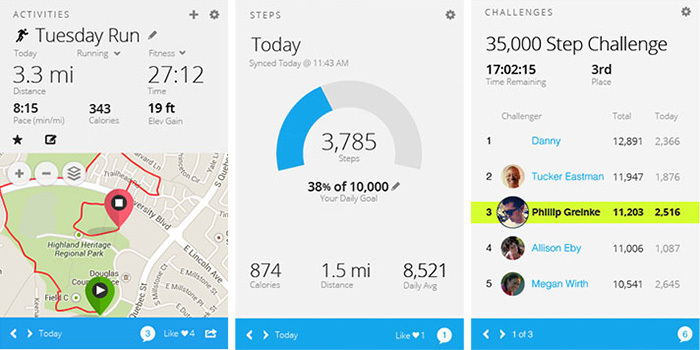 It keeps you motivated by tracking pace, calories, distance, personal records and heart rate. 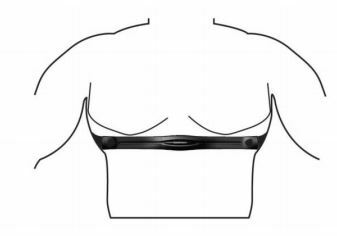 The optional heart monitor is a thin black band designed to be worn on the chest, just under the pectoral muscles. The Forerunner 15 connects wirelessly to this device and will keep track of heart rate and heart zone information, such as elevated beats. It features a real time heart beat monitor to better track heart rates during the run while compiling a chart of heart activity throughout the run. The FR15 can best be thought of as a FR10 (which was officially announced in August 2012) that grew up and went to school. The FR10 (which landed at $129US being a slight premium over the other units) was Garmin’s first budget GPS watch and was introduced at a time when there were only a few sub-$100 GPS watches to have hit the market and the closest of Garmin’s offer was over twice that amount. Because the Forerunner 15 uses satellite GPS tracking, the device is best worn for outside running and training. Garmin features an optional Forerunner compatible foot pod for around $70 to be used for treadmill or indoor track activity. Garmin’s foot pod uses MEMS inertial sensor technology and is accurate to 98 percent for indoor activity. It is small enough to be worn on the laces of the runner’s shoes or to fit into the sole pocket on pod compatible shoes as with any foot pod, but it is designed to wirelessly connect to the Forerunner 15. Garmin Connect is Garmin’s exclusive online community and information storage site. 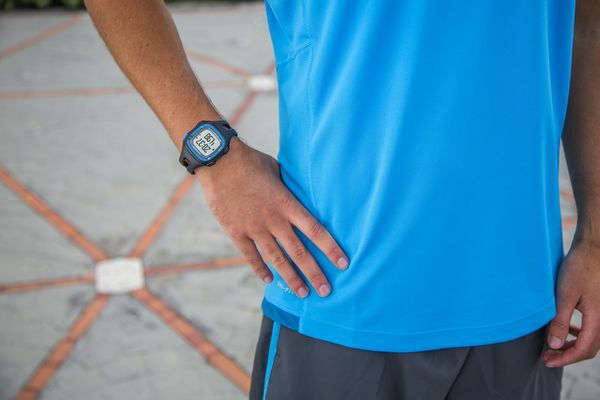 With Garmin Connect, the runner can store unlimited information for past workouts; the watch itself only stores the history for seven runs. Garmin Connect is free and easy to use with the software provided with the Forerunner 15. Garmin Connect allows the storage and sharing of progress, provides online challenges for even more motivation, and rewards progress with virtual badges and other awards as well as comparisons of other runners’ progress. The web site is compatible with all Garmin running devices. 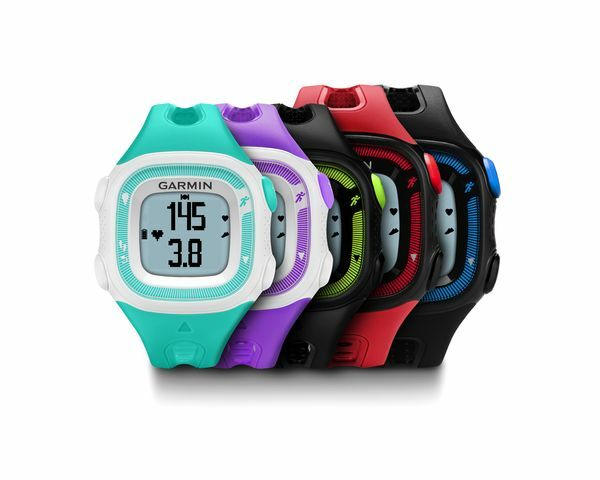 The Garmin Forerunner 15 is available in two sizes, small and large, and several different color choices. The watch itself comes with the Forerunner 15, user’s manual and a charging data cable for just under $170. It can also be purchased with the heart monitor for $199.99. Other options for the Garmin Forerunner 15 include carrying cases, an AC adapter, and the foot pod as well as additional charging cables. The Garmin Forerunner 15 is an effortless way for runners to keep track of times, cardiac activity, pace and miles run. 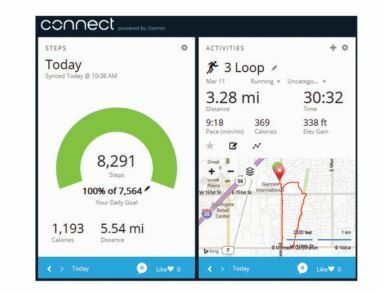 It tracks personal records and progress and, in partnership with Garmin Connect, is an affordable, motivational way to train for the casual or serious runner. The easy to use, versatile and stylish Garmin Forerunner 15 is another home run from a company that has always led the way in GPS tracking technology. By monitoring calories burned, distance and steps with the Garmin Forerunner 15 activity tracking feature, you can stay on top of your goals for fitness. Studies tell us that extended periods of inactivity, including sitting at a desk, has ability to raise health problem risks, irrespective of regular exercise though this can be reversed by taking regular short walk breaks throughout the day. With the Forerunner 15, not only do you accomplish your running goals, you also remain active between workouts and establish healthy habits. It can be worn all day, having a battery life of up to five weeks in activity tracking/watch mode or up to 8 hours in GPS mode. It inclusively features a reminder to move after an hour of inactivity which can only be reset after continually walking for a few minutes. Come rain or shine, with the Forerunner that is water resistant up to 50 meters, runners can view their present pace with ease, with the option of choosing average pace or lap pace. The Forerunner inspires you to lace-up and go, enjoying preset timer loop pages, an easy to use four button user input, customizable data fields that fit your needs and stored personal records. It will automatically alert runners when every mile is completed with a friendly beep and a flash of the backlit screen, thereby motivating you with its auto lap function. The forerunner 15, which is Garmin’s latest GPS running watch and blends the best of the VivoFit and the FR10 for daily wear, has broken cover. It tracks both everyday movement and particular running workouts, and as of this summer, sleep. Just like other GPS watches by Garmin, with integrated GPS tracking, the Forerunner 15 can track location. It will be offered in two large-face in black/blue and red/black as well as three small-face color options of black/green, violet/white, and teal/white with each having a rechargeable battery with the battery life that we have already specified before. Available this Spring of 2014, the Forerunner 15 will come in teal/white, black/green, and violet/white in small face and band width; and red/black, and black/blue in large face and band width. It focuses on developing innovations and technologies to improve users’ lives and foster active and healthy lifestyles. Garmin’s fitness devices are becoming essential tools for both elite and amateur athletes in cycling, running and other athletic pursuits. The FR 15 has a suggested retail price of $166 and $199.99 for the Heart Rate Bundle that includes with it a heart rate monitor to be worn on the chest. 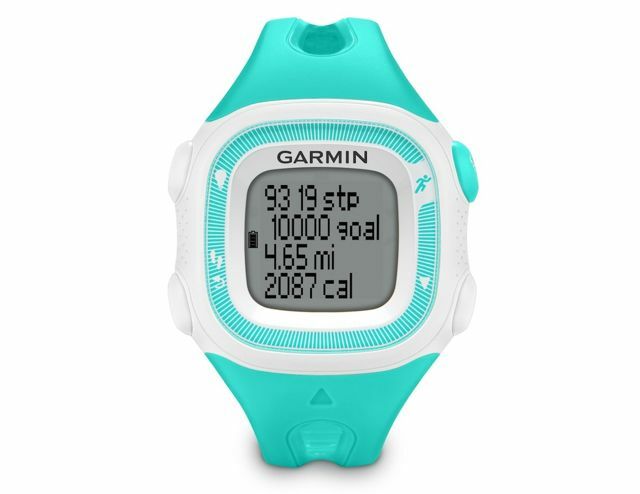 Women’s Forerunner 15 GPS Fitness Monitor and heart rate monitor are included in the bundle. This is to zone data for any fitness activity and track your heart rate. Upload data to the free Garmin Connect online community to join fitness challenges and save, plan and share your progress. When using your device for the first time, you should complete these tasks to set up the device and learn about the basic features. A flashing icon means the device is searching for a signal. A solid icon means the signal was found or the sensor is connected. The device comes partially charged. You may need to charge the device before going for a run. 2 Hold to turn on the device. 4 Go outside, and wait while the device locates satellites. It may take a few minutes to locate satellite signals. When satellites are located, signal displays solid. 5 When using a heart rate monitor, wait while the device connects to the sensor. When the device detects the heart rate monitor, a message appears and heart shape displays solid. 6 Select Start to start the timer. 7 Go for a run. 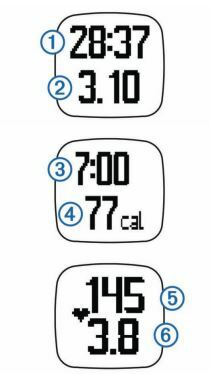 Time 1), distance 2), pace 3), calories burned 4), beats per minute 5), and heart rate zone 6) are recorded while the timer is running. 8 After you complete your run, select runner to stop the timer. Select Resume to restart the timer. NOTE: After a few seconds, a summary appears. Select Discard to delete the run. You can connect with your friends on Garmin Connect. Garmin Connect gives you the tools to track, analyze, share, and encourage each other. Record the events of your active lifestyle including runs, walks, rides, swims, hikes, triathlons, and more. Store your activities: After you complete and save an activity with your device, you can upload that activity to Garmin Connect and keep it as long as you want. Analyze your data: You can view more detailed information about your activity, including time, distance, heart rate, calories burned, cadence, an overhead map view, pace and speed charts, and customizable reports. NOTE: Some data requires an optional accessory such as a heart rate monitor. Track your progress: You can track your daily steps, join a friendly competition with your connections, and meet your goals. Share your activities: You can connect with friends to follow each other’s activities or post links to your activities on your favorite social networking sites. 1 Connect the device to your computer using the USB cable. To prevent corrosion, thoroughly dry the contacts and the surrounding area before charging or connecting to a computer. 1. Plug the USB cable into a USB port on your computer. 2. Align the charger pots with the contacts on the back of the device, and press the charger until it clicks. 3. charge the device completely. Your device can be used with wireless ANT+ sensors. The device may cause chafing when used for long periods of time. To alleviate this issue, apply an anti-friction lubricant or gel to the center of the module where it contacts your skin. Do not apply anti-friction gel or lubricant on the electrodes. Do not use gels or lubricants that contain sunscreen. You should wear the heart rate monitor directly on your skin, just below your breastplate. It should be snug enough to stay in place during your activity. 1 Push one tab 1) on the strap through the slot 2) in the heart rate monitor module. 2. Press the tab down. 3. Wet the electrodes 3) on the back of the module to create a strong connection between your chest and the heart rate monitor module. 4. Wrap the strap around your chest and attach it to he other side of the heart rate monitor module. The Garmin logo should be right-side up. 5. Bring the device within 3m (10 ft.) of hte heart rate monitor. After you put on the heart rate monitor, it is active and sending data. The first time you connect an ANT+ sensor to your device, you must pair the device and sensor. After the initial pairing, the device automatically connects to the sensor when you go for a run and the sensor is active and within range. NOTE: If your device was packaged with a heart rate monitor, the device and sensor are already paired. 3. Bring the device within 1 cm of the center of the heart rate monitor, and wait while the device connects to the sensor. When the device detects the heart rate monitor, a message appears and love shape displays solid. This entry was posted in Garmin GPS Running Watch and tagged Garmin® Forerunner® 15, Heart Rate Monitor Garmin. Runners Do you wave or smile?